The Three Weeks is an annual mourning period that falls out in the summer. This is when we mourn the destruction of the Holy Temple and our launch into a still-ongoing exile. The period begins on the 17th of the Hebrew month of Tammuz, a fast day that marks the day when the walls of Jerusalem were breached by the Romans in 69 CE. 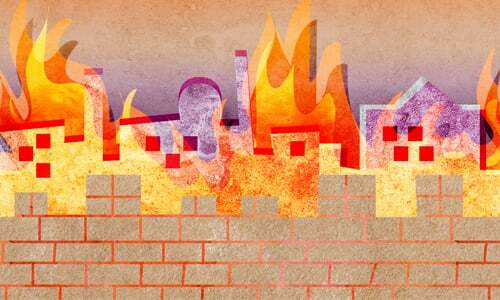 It reaches its climax and concludes with the fast of the 9th of Av, the date when both Holy Temples were set aflame. This is the saddest day of the Jewish calendar, and it is also the date that many other tragedies befell our people. There are various mourning-related customs and observances that are followed for the entire three-week period (until midday of the 10th of the Hebrew month of Av, or—if that date falls on Friday—the morning of that day). We do not cut our hair, purchase new clothes, or listen to music. No weddings are held. 17 Tammuz is a fast day, on which we refrain from eating and drinking from dawn to nightfall. Those who mourn the destruction of Jerusalem will merit seeing it rebuilt with the coming of MoshiachThe final Nine Days of the Three Weeks are a time of intensified mourning. Starting on the first of Av, we refrain from eating meat or drinking wine, and from wearing freshly laundered clothes. 9 Av is a more stringent fast than 17 Tammuz. It begins at sunset of the previous evening, when we gather in the synagogue to read the Book of Lamentations. Besides fasting, we abstain from additional pleasures: washing, applying lotions or creams, wearing leather shoes, and marital relations. Until midday, we sit on the floor or on low stools. There is more to the Three Weeks than fasting and lamentation. Our sages tell us that those who mourn the destruction of Jerusalem will merit seeing it rebuilt with the coming of Moshiach. May that day come soon, and then all the mournful dates on the calendar will be transformed into days of tremendous joy and happiness. Watching movies during the three weeks would be permitted if the following two conditions are met. Thanks for the article. May I ask a question? During the observed 3 weeks, how should one act on sabbath, since that is a day of enjoyment? You really should speak to your rav about it. There is no clear answer. Many authorities permit it if you will lose your skill over that period if you don't practice. Then it will be considered a financial loss. However, you must make sure that you are not doing it for pleasure. That means playing sadder songs, if possible. We mark these days because that will inspire us to do everything in our power to beseech G-d to return us to The Land of Israel and rebuild the Holy Temple in Jerusalem with coming of our Righteous Messiah.